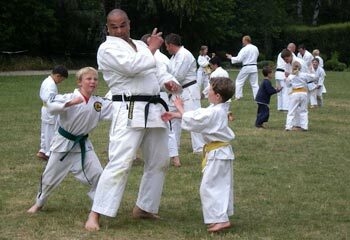 My interest in the martial arts started at an early age.In the late 70’s I joined Kokushin club here in Westport before it folded. Early 80’s saw the formation of Cho Wa Do under Craig Barlow where I trained for 3 years before moving away from the district. When I returned to Westport in 1994 I started with Westport Karate under Sensei Paul Allot, gaining my Shodan in 1998 & Nidan in 2001. The new millineum saw many upheavals in the way Goju ryu Karate in Westport (& NZ) was going so I decided to cut my ties with the club & took some time off from training. 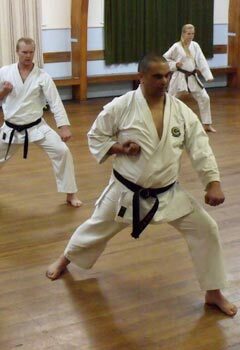 It wasn’t until a chance meeting with Tony Foster Renshi in 2003, when he asked me to start a new club, that our dojo was formed & we have been training since then. Remaining an independent organisation with ties to Christchurch Goju Ryu Clubs under Sensei Hayden Willmot and a direct link to Jundokan (in a letter to Sensei Foster from Miazato Sensei before his Death) has allowed us to remain faithful to Goju Ryu teachings. It was a privilege to meet Yasuda Sensei back in 1999 when he was in his 70’s & had been training since the 30’s! In 2014 I was honoured to be graded to 4th Dan by Jundokan 9th Dan Masters Sensei Gima and Senei Kinjo. I enjoy the interaction with the students of all ages & teaching keeps me physically & mentally active. I find after all this time I am still learning as unlike most other sports to be proficient in Karate it cannot be learnt in a few months or years, but takes a lifetime and hope to continue with my training for as long as I am able.